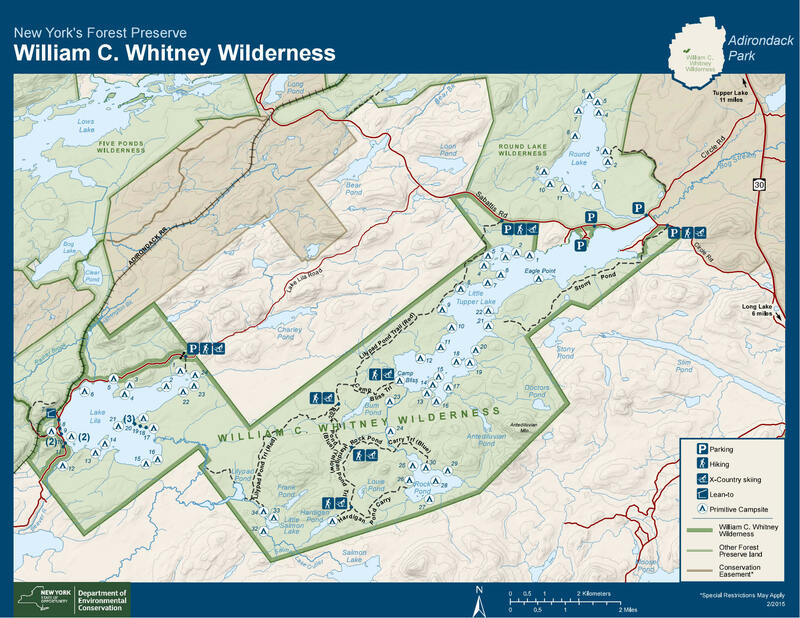 The 20,500 acre William C. Whitney Wilderness is located in the Town of Long Lake in Hamilton County, near the geographic center of the Adirondack Park. The land was acquired by the State of New York in 1997 and is centered around Little Tupper Lake and includes the beautiful remote Lake Lila. 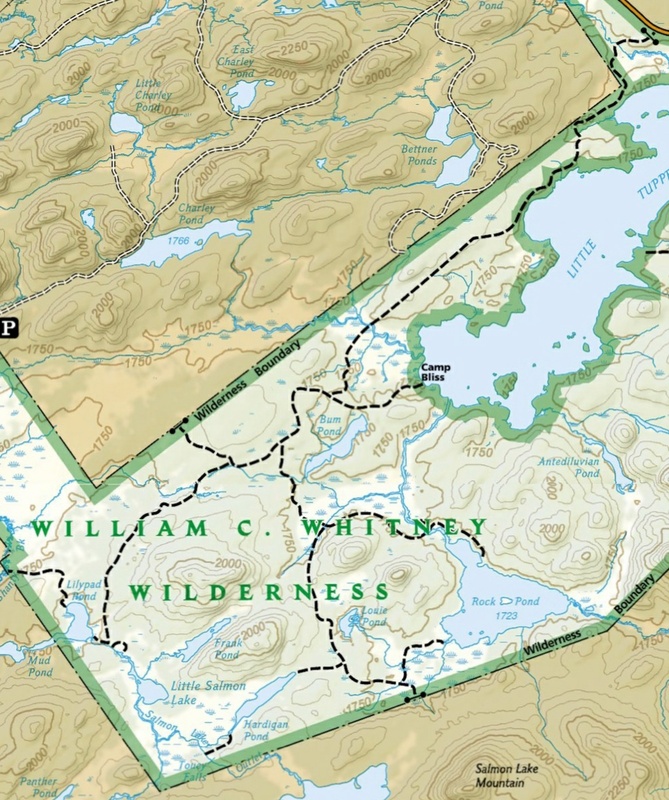 The centerpiece of the William C. Whitney Wilderness is Little Tupper Lake. Nearly six miles long and up to a mile wide, with 20 miles of shoreline, it is a broad avenue leading into the remote heart of the forest. Except for three private holdings, the entire lake is State-owned. Ten additional lakes and ponds within the area provide additional recreational opportunities. 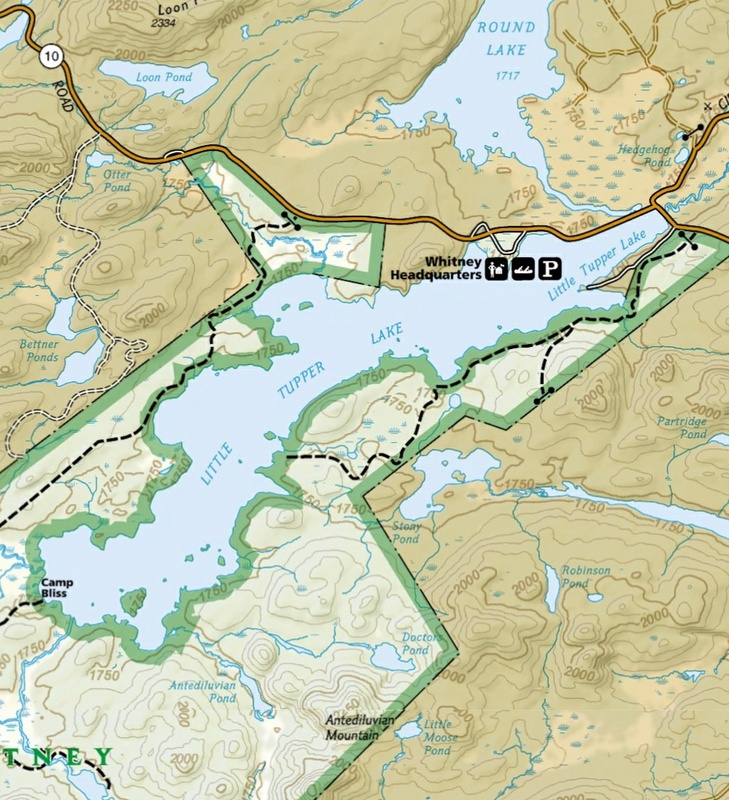 There are numerous designated primitive campsites, most boat accessible only, around Little Tupper Lake. There are campsites found around the shores of scenic Lake Lila as well. There are more along Rock Pond Outlet as well as on the shores of Rock Pond. There is one campsite on Hardigan Pond and three others on Little Salmon Lake. This area is a backcountry kayaker's delight, especially someone looking for remote and secluded places. The landscape surrounding the waters of the wilderness is composed of low, forested hills with a few modest mountains. Elevations above sea level range from 1,717 feet at the surface of Little Tupper Lake to 2,297 feet at the summit of Antediluvian Mountain. Extensive wetlands stretch out from the ponds and streams. Within the William C. Whitney Wilderness, the opportunities available to the public include a many recreational activities within a "wilderness" setting. You can enjoy canoeing, kayaking, fishing, hiking, camping, watching wildlife, hunting, trapping, cross-country skiing, and horseback riding, all within a setting of quiet and peaceful solitude. The most popular destinations in William C. Whitney Wilderness is Lake Lila. Many visitors climb Mount Frederica for its 180 degree views of Lake Lila. The lake is very scenic and remote, however you will probably see other visitors at this very popular location due to it's amazing beauty. The Whitney Area contains an extensive and historic system of navigable lakes and streams which are readily accessible by canoe or non-motorized boat. The only approved location for waterway access is at the headquarters lot. This site is hand launch only, boats must be carried to the water. There is a large parking area at the headquarters. From the single put-in site you can explore Little Tupper Lake and, with a short carry on Rock Pond Outlet, easily paddle into Rock Pond. 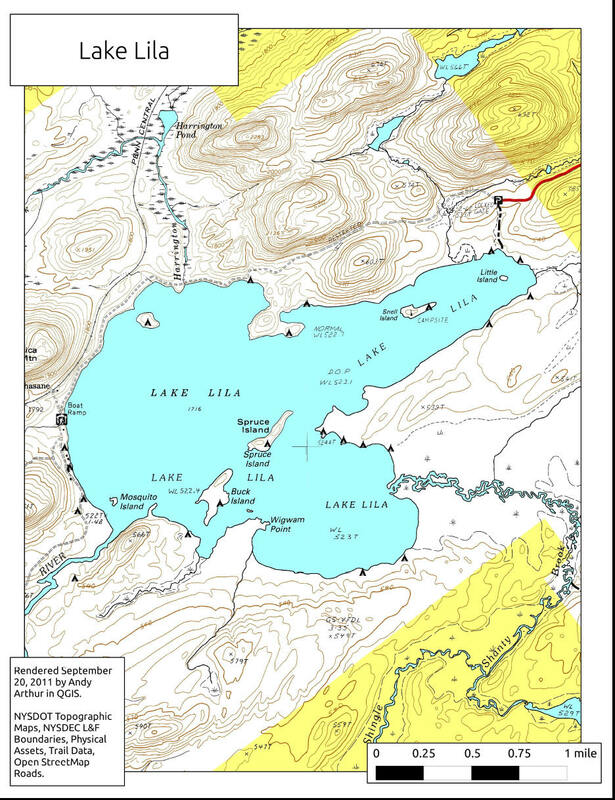 A canoe carry trail will be marked from the northern shoreline of Lilypad Pond to Shingle Shanty Brook for the more adventurous who may want to paddle into Lake Lila. You may have to carry around beaver dams along your way. Camping is only allowed at campsites marked with yellow "Camp Here" disks. These primitive tent sites provide space for no more than three tents and accommodate a maximum of eight people. 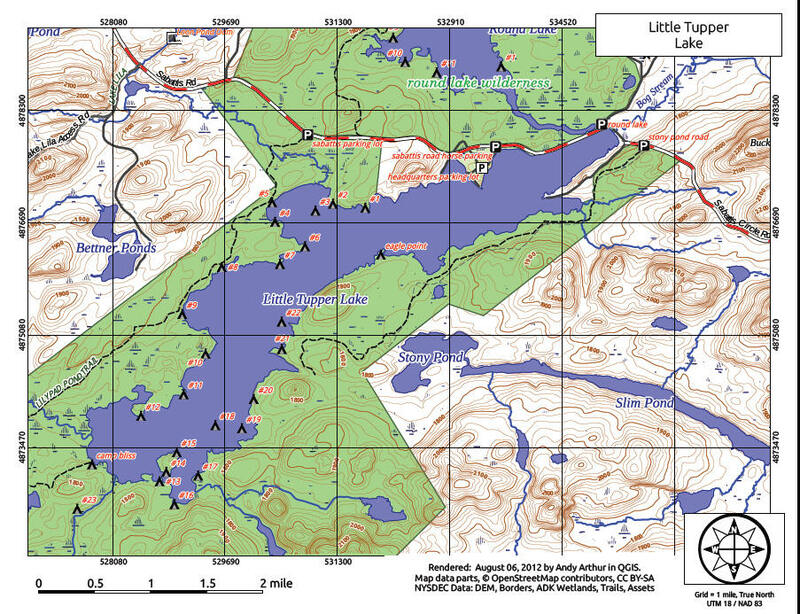 Look below for a couple of maps that show some of the campsites on Little Tupper Lake and Lake Lila. Large groups are not allowed to camp in this area. When traveling to any backcountry area you should be properly prepared and equipped. You should be aware of special safety considerations and the rules for the proper use of New York State Public Lands. Within the Whitney Area the relatively unvarying terrain and the complex system of roads on the property make it essential that visitors plan carefully and make use of a compass and good maps when traveling. Also be aware of the winds and waves on Little Tupper Lake. The prevailing winds and shallowness of Little Tupper Lake often results in large waves. Winds do not have to be exceptionally strong to create whitecaps on Little Tupper Lake. During periods of rough weather, canoeists are advised to keep near shore. Woods roads on both sides of the lake provide emergency exit routes if necessary. Be prepared. Burn Road Trailhead - This trailhead is on Sabattis Road, 1.4 miles west of the headquarters entrance road, and provides access to points along the north shore of Little Tupper Lake and branches off to several interior waters, the largest being the 281 acre Rock Pond. A 13.5-mile foot trail system utilizes the existing logging roads. There is a large parking area. The GPS coordinates are N44 03.226 W74 36.906 for the parking area. Look below for more information. Rock Pond Trail (blue markers, 2.8 miles) - This trail begins after walking 5.7 miles west of the Sabattis Road on the Lilypad Pond trail. The Rock Pond Trail proceeds in a southerly direction, passing by Frenchman's mine, continues southeasterly crossing over Rock Pond Outlet on a bridge and eventually ending on the eastern shore of Rock Pond. Hardigan Pond Trail (yellow markers, 1.5 miles) - This spur trail begins on the Rock Pond Trail approximately 0.5 mile south of Frenchman's Mine. The trail proceeds southwesterly, turning onto an old railroad grade just before Hardigan Pond. Camp Bliss Trail (yellow markers, 1.0 miles) - After purchase by the State and demolition of buildings, a trail will be marked that begins on Burn Road approximately 4.7 miles west of the Sabattis Road parking area. 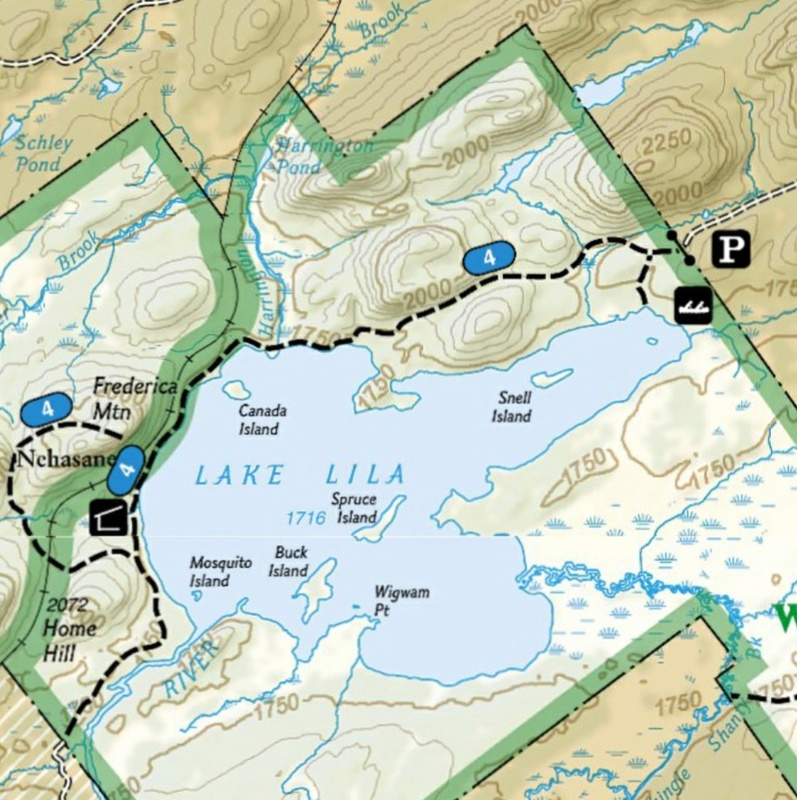 The trail proceeds in a southeasterly direction passing by the eastern edge of Bum Pond to a large cleared area on the western shore of Little Tupper Lake. Stony Pond Road Trailhead - This trailhead with no parking facility is on Circle Road, 0.4 mile south of the Sabattis Road junction. South Shore Trail (yellow horse markers, 4.0 miles) - This marked horse trail starts along this woods road heading west along the south shore of Little Tupper Lake and ends approximately four miles from the public highway at two separate camping areas. Winter Activities: The trails and unplowed roads within the Whitney Area offer numerous opportunities for backcountry cross-country skiing and snowshoeing. When parking at the Lake Lila parking lot, do not block the gate to the private road. Beaver activity has caused a washout on the Burn Road Trail at the Otter Pond Brook crossing. It is still passable but use caution.